Cupping education. Com - With the increasing number of education participants cupping and many alumni education bruise practicing and successful therapy to his patients, without compromising the quality of education, Education and Training bruise , carried out on Sunday morning, during July-August , 2016 No promo additional to the pesertanya.Ikuti Education and Training Cupping in July-August, 2016 . Promo is Free or free Membership ITBI For 5 Years with Cupping Training Education Program Following the July-August , 2016 . Cupping education and training bruise on Sundays starting at 08:30 to 11:00 pm. Education and training of this cupping system using RECORD (Quick - Safe - Right - Natural - Integrated) are initiated by Ustadz H. Galina Gumelar , ST, M.Si (National Cupping Therapists) so that even in a short period of time the participants were able to master medical education cupping and able to practice professionally. Education and training bruise in July-August , 2016, There is a wide selection of educational packages, either face to face with the system or remotely (online). Investments start from Rp.850,000 to Rp. 1,000,000 for education and training bruise directly and start from Rp.1.300.000, - for education and training cupping online (distance). Using the method of RECORD (Quick - Safe - Right - Natural - Integrated), so that the participants / students can be proficient cupping therapy is really useful. Audio-visual presentation module, power point, video, Microsoft Word and PDF. For those who take the facility 3 certificate, get a membership certificate IAHTA which has had members of the shared world of cupping therapist. To pay the total cost of invest the education and training of Rp.1.600.000, - Discount of 50% to only pay a total of Rp. 800,000, - for two certificate ( Certificate of Education and Certificate of Membership ITBI For 5 Years Worth 200.000, - -Berlaku Over July-August, 2016 ) or a total of Rp. 2.000.000, - Discount become only pay Rp.1000.000, - for the three certificates in addition to the membership certificate IAHTA (International Al-Hijama Therapists Association) valued at $ 100 USD. 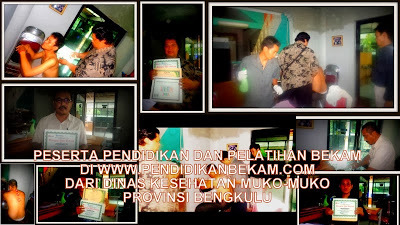 Or pay the total cost of education and training to invest Online method is Rp.2.600.000, - discount of 50% to a total of Rp. 1.300.000, - get education certificates, membership certificates ITBI (Cupping Therapists Association of Indonesia) and a membership certificate IAHTA (International Al-Hijama Therapists Association) worth $ 100 USD. For those who want to follow cupping online education and training (distance) please register via the online registration form here.